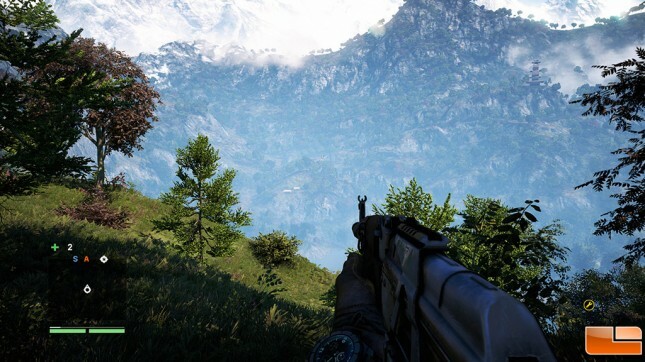 Far Cry 4 is an action-adventure first-person shooter video game developed by Ubisoft Montreal and published by Ubisoft for the PlayStation 3, PlayStation 4, Xbox 360, Xbox One video game consoles, and Microsoft Windows. It is the sequel to 2012’s Far Cry 3. The game was released on November 18th, 2014 in North America and Europe. Far Cry 4 follows Ajay Ghale, a young Kyrati-American who returns to his native country Kyrat to spread his deceased mother’s ashes. He finds the country in a state of civil war between Kyrat’s Royal Army led by the country’s eccentric and tyrant king Pagan Min and the Golden Path, a rebel movement fighting to free Kyrat from Min’s oppressive rule. Far Cry 4 uses the heavily modified Dunia Engine 2 game engine with Havok physics. The graphics are excellent and the game really pushes the limits of what one can expect from mainstream graphics cards. We set game title to Ultra image quality settings and did not adjust any of the advanced settings. 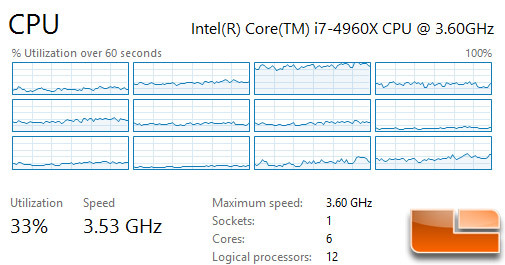 Far Cry 4 uses about 30% of the processor and is running on multiple cores as you can see from our screen capture above. 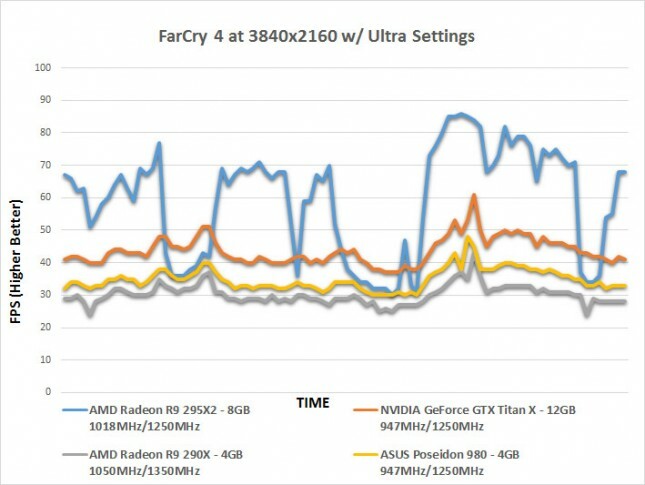 One core has more of a load on it than the others, but all logical processors are being uses to some degree when playing Far Cry 4. 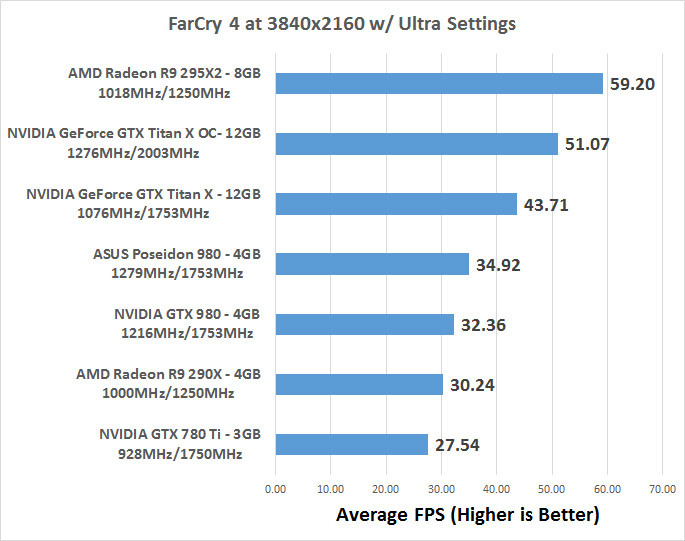 Benchmark Results: In Far Cry 4 we found the new NVIDIA GeForce GTX Titan X video card put up a respectable score of 43.71 FPS, which makes the 32.36 FPS on the NVIDIA GeForce GTX 980 reference card looks underwhelming. When overclocked the GeForce GTX Titan X was able to average 51.07 FPS on FarCry 4 and out gaming experience was excellent on this awesome looking game title. The AMD Radeon R9 295X2 had the highest average FPS at 59.20, but it was choppy at various times when we were playing the game title. Benchmark Results: The AMD Radeon R9 295X2 might have won the average FPS battle, but the game play wasn’t smooth. When we charted the FRAPS log and looked at performance over time we found that the Radeon R9 295X2 dropped down below 30FPS once and down to nearly 30 FPS several times. The NVIDIA GeForce GTX Titan X never dropped below 37 FPS, so there was nearly a 10 FPS difference in the minimum frame rate during our benchmarking session.